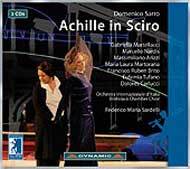 Achille in Sciro is a dramma in musica in three acts by Domenico Sarro based on a text by Metastasio which inaugurated the San Carlo Theatre in Naples on 4th November 1737. Sarro was Maestro di Cappella (court musician) of the Royal Court and dedicated this work to King Charles III of Bourbon, who planned the building of the magnificent Neapolitan theatre. Dedicated to both the operatic and the sacred repertoires, Domenico Sarro had set himself on a line of independent creativity, distinct from the first generation of Neapolitan musicians who followed in the wake of the founder Alessandro Scarlatti and more in harmony with the group of the new composers, such as Porpora, Vinci and Leo. He had always sought out authoritative texts to set to music, keeping faith with the principles of operatic tradition (the primacy of the sung line over the poetic structures and their theatrical meanings) with some slight concessions to local tradition The plot, based on a fable by Iginus with some interpolations by Racine, may be seen as a homage to the king, and more generally as a celebration of royal power. Achilles\' mother, upon learning of her son\'s destiny to perish in the Trojan war, dresses him as a young woman (Pyrrha) and hides him away in the court of King Lycomedes at Skyros. His disguise does not prevent him from falling in love with princess Deidamia, but the idyllic relationship is threatened by the arrival of Ulysses who awakens Achilles\' dormant masculinity to fight the Trojans. The opera provides the usual happy ending: the hero re-establishes his male role and embraces his destiny of warrior, all the while honouring his commitment to love and marry Deidamia. Love and glory are proved compatible, in a happy conclusion which is typical of the late baroque opera seria. Performed several times after the inauguration of the theatre, the opera soon fell into oblivion and this is the first representation in modern times, 270 years after the premiere. These CDs were recorded during the Martina Franca Festival, whose uniqueness is to present rare and neglected opera masterpieces. Particularly interesting is the presence of a second male voice, a tenor, in the place of the traditional second woman.